WHY ARE MYSTERIES POPULAR DURING FRAUGHT TIMES? I just completed a two thousand mile road trip through the country from Chicago to California. This probably counts as the farthest I've driven ever. It also counts as one of the least pre- planned trips I've ever taken and it worked beautifully in ways I hadn't anticipated. More on that later. For this trip I needed to do a little research for a work in progress and most of it involved historical facts of the American West. Oregon Trail, Gold Rush, Native American artifacts--things like that. Some quick research revealed that most of the places I wanted to see were either gone, as in destroyed, or not accessible in one drive west. I'd have to break it into a couple of trips. My final destination was California and so I gave up planning and figured I'd just head west and see what happened along the way. I packed up the car and barreled out of Chicago. The first bit of serendipity involved a beautiful, blue semi tractor trailer that pulled up next to us on the road to Omaha. I glanced up at the lettering on the door, only to realize that it was owned by the son of my Dad's cousin (so my second cousin), and a part of the extended family that have been truckers for generations. I kept peering into the cab to see if he was driving or another driver, but I couldn't see through the window's glare and I hesitated to text any driver. I ended up texting everyone else in the family to tell them. Still don't know if it was him, but if so, we spent hours passing each other several times, when we would stop for a break and he wouldn't and vice versa. I felt like family was guarding me on my way west. 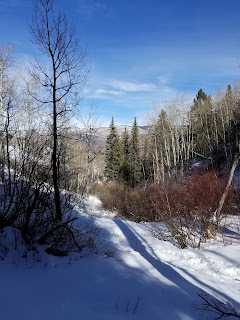 The second bit of serendipity was Beaver Creek. We hit the ski spot on the second day and decided to stay a couple of nights. We'd ski on the first and snowshoe hike on the second. The skiing was fine, warm weather meant spring-like skiing, but there was just enough snow for all the runs to be open. The second day was snowshoe hiking. Our guide studied wildlife, and she showed us the bear claws on the Aspens. Seems the bears climb the trees for the best morsels, and their brown claw marks are visible on the trunks. They were scratched all the way up. Let's just say that if a brown bear is chasing you, climbing a tree is NOT an option. The guide gave me a lot of facts about the men and women that ventured west, which will be helpful to add to my story. The third bit of serendipity was our stop at the Fremont Indian State Park in Utah. This is a park along Interstate 70. Unlike the larger Zion National Park, this one is less well known. I had been googling interesting hiking, and found it. The Fremont tribe is believed to have inhabited this area until around the 1300's. Most of their story is pieced together from a treasure trove of artifacts discovered in the 1980's when the excavators for Interstate 70 began digging. There are rock etchings at locations listed on a short hike through the park and pottery and other artifacts are displayed in a small museum on site. The serendipity here was when the ranger told me that he had atlatls and spears that we could try our hand at throwing. I had written a scene with a warrior using an atlatl, which is a short stick that attaches to the end of the spear and acts as a propulsion device, much like a fishing rod does, and I was thrilled to be able to actually throw one. He gave my husband and me an atlatl and three spears each and we trooped out to the target area. You notch the end of the spear onto the back of the atlatl and hold the spear with your two fingers, almost like a pencil. The sketch to the right shows the method. Then you fling the spear, trying to keep your movement even. The first two throws missed the target (a hay bale) completely and the third hit but bounced off harmlessly. We collected our spears and tried again. Eventually we were able to get the accuracy and speed right. You can watch the video of me throwing one that stuck below. This was a lot of fun, and the park hosts a festival the second weekend of May with a spear throwing contest, bartering market and all kinds of fun things for adults and kids. If you're near the area or traveling through, check it out! We hit Las Vegas and stayed the night. Though nothing was able to be learned about the Wild West, we had a great visit, kept our wallets intact, and landed in California on time. Who says research isn't fun? What a great trip -- now I want to know where all of this research will appear....in what new novel? Your foray west reminds me of a comment I heard in a workshop during our Thriller Writers conference. When asked whether he outlines his stories, this bestselling author said, "I think there are two kinds of writers: the tour bus driver and the hitch-hiker. The tour bus driver knows where he starts and while he may pick up some interesting characters along the way, he knows exactly where he is going, when he will be stopping and where he will be ending the journey. But the hitch-hiker starts somewhere, has an idea of a destination but has no clue who he will meet or how he will get there." So now I'm wondering if you, Jamie, would fit into one of those categories. Thanks for a really interesting post! What a fascinating trip, Jamie. It's one I dream of taking with my husband, who's been around the world but somehow missed our West. Your detail and descriptions brought back a lot of good memories and introduced me to new things. Fascinating about the atlatl - I'd seen photos but never one in action. Congratulations on a great throw! I'm wondering about the Fremont Indians, whether that's their original name. A lot of stuff in the West got named after John Fremont to which he had no entitlement other than ego. Again, I loved your post -- food for the mind and soul! Hi Karna and Gayle: Glad you liked the post. And Karna, I'm definitely a hitchhiker! I don't outline my books--just sit down and write, and this trip was the same way. I was googling things on my phone as we drove and we'd pick places and just stop. Great fun. Gayle, I think ! I recall the ranger mentioning his name because a nearby river is named after him. I just googled him and he sure sounds like he was a real pain. The things you learn..... Thanks for mentioning him! It seems a lot of the best trips are those that are just allowed to happen. I can remember taking the kids on a spring break trip with a starting destination and 7 days. We drove south to Carlsbad Caverns in NM, explored the caves and then asked the girls where to next. We ended up driving south into Texas, to El Paso, back through Arizona to the Grand Canyon. We visited the White Sands National Monument in Alamogordo, NM, stopped in Santa Fe to shop the Indian Market, passed by the Sand Dunes in Colorado and stopped at the alligator farm. The girls were little, but it's a trip they still talk about. We just did what we wanted, stopped when we wanted, moved on when we wanted and we really enjoyed each other's company. I think everyone should take such a road trip at least once. You feel so free! Thanks for sharing--and next time, call when you pass through Denver. You have two Rogue Women who live out here in the West. We would have loved to meet you for a glass of wine, a cup of coffee, or even act as a quick stopover. The Grand Canyon! Can you believe I've only seen it from the window of an airplane. Your trip sounds wonderful. I agree that everyone should try this and I'm going to do it again for sure. And I'll take you up on your offer to stop in Denver. Would love to see you. Until next time!